With Thanksgiving behind us and Christmas and New Year’s right around the corner, the holiday season is officially upon us. If you are just now considering how your business can leverage opportunities and grow throughout the festivities, you will be glad to hear there is still time to prepare your business for the holiday season. Consider the following 6 tips your business can still implement as we move into December. Is your website long overdue for an update? Have you been waiting for the right time to improve your inventory tracking system? Could you use some extra help with marketing? If you have been considering changes that would help bring in more customers or streamline your processes, now is definitely the time to do it. Once the holiday shopping season is in full swing, it will be difficult to find the time to make big changes. Taking care of things you have been putting off will ensure you can seize opportunities to grow your business and make it run more smoothly this holiday season. This time of year can be very stressful. On top of the increased pace at work, there are family celebrations, social commitments, gift shopping and holiday travel plans. You can relieve some of this stress for your employees and help them embrace the holiday spirit with thoughtful planning. For example, if you decide to host a holiday party, consider setting the date after New Year’s when your team has more free time, or schedule the party during work hours. You can also let your team choose a charitable project to support and then match their contributions in some way. 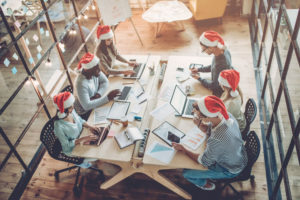 Establishing office holiday traditions will encourage employees to come together as a team and improve morale during the hustle and bustle of the holiday season. During the holidays, every business jumps at the chance to target prospects with more messages and emails than usual. Unfortunately, this can cause your message to get lost in the masses of emails your customer’s are receiving every day. The key to avoiding this is personalization. If you customize your messages according to your customer’s preferences, your message will offer real value – and it is more likely to be read. As you piece your message together, make sure you also consider all the data you have: what customers responded to last year, what the current trends are and what you know about your loyal customers' needs and preferences. Ultimately, you want the message to deliver value of some kind to your recipients (e.g. discount or free product/service), so your message is more than just another promotional email in their inbox. Thanks to the ever-changing world of technology, customers are more mobile than ever before. In addition to holiday festivities and family gatherings, your customers still have meetings, on site visits with their own customers and industry events. This can make it even more challenging to connect with them this time of year. One of the easiest ways to overcome this barrier is to incorporate marketing automation. Utilizing push notification, SMS marketing messages or group messages can help you reach customers wherever they happen to be. You can even go a step further and schedule your business’ notifications. While you sip your hot cocoa, your automated notifications will inform your customers about limited-time promotions and discounts. It is always important to be a socially responsible business, but especially around the holidays. This time of year, many companies are focused on gaining new customers, converting them into loyal clients and improving their bottom line. However, it is important for businesses to also remember ‘tis the season to give back. Take some time to brainstorm with your team to find creative ideas that allow you to give back while also engaging with your customers. For example, an online fundraiser, a canned food drive or a volunteer event partnering with a local charity are great ways to give back to your community. You can also do a little research on sites like Guidestar and Charity Navigator to help you pick the right charity. Whatever you choose to do, focus your efforts on giving back and not promoting your business. Your customers will take notice and appreciate that your business lent a helping hand during the holidays. Along with new opportunities, the holiday rush can also lead to unexpected expenses and additional costs. Whether you need to purchase additional inventory, hire more staff or boost cash flow to keep things running smoothly, knowing where to get the capital you need is a must. The key is to find a cash solution that fulfills your immediate cash flow needs without jeopardizing your business’ long-term success. For this reason, many businesses turn to an invoice factoring company. Invoice factoring allows your business to factor its unpaid invoices and generate quick cash. Rather than waiting 60 or even 90 days to receive payment from your customer, you can factor the outstanding invoice and receive an advance of 80-90%. Your business gains access to the quick capital it needs to cover unexpected holiday expenses and the flexibility to say “yes” to new business opportunities – minus an added burden of debt. The holiday season is a great time to put new ideas into motion, strengthen customer relationships and maximize the unique opportunities it brings. With the right planning, your business can make the most of this holiday season. Does your small business need a little extra cash this holiday season? Security Business Capital, based in Midland, Texas, is a premier invoice factoring company with years of experience. The team of experts at Security Business Capital specialize in helping companies secure the funds they need to operate smoothly, grow their business and take advantage of opportunities. Security Business Capital’s invoice factoring services, for example, allow you to use unpaid invoices to easily secure the cash your business needs. To learn more about Security Business Capital’s invoice factoring option (or our other service options, like purchase order funding), contact SBC for a free quote and/or consultation.